The Short Version: Online dating has seen almost exponential growth in popularity since the early days of the internet. But the web’s widespread use has also meant a steady increase in the number of criminals targeting digital daters and the sites they visit. For more than 20 years, Panda Security has been safeguarding the personal and proprietary data of individuals and businesses online. For those seeking to find love on the internet, Panda’s comprehensive antivirus suite offers complete protection from malware and other information-grabbing threats. The company also provides website owners powerful security tools, such as endpoint protection and enterprise-grade perimeter barriers, to keep their networks and visitor data safe from those with malicious intent. Panda’s two-decade history positions the organization to understand the evolving online threat landscape, which is why more than 30 million users worldwide are employing its solutions today. While being introduced through mutual friends remains the most common approach to meeting people, online dating has become the second most popular way for singles to connect. With the prevalence of online daters and the growing number of sites that cater to them, criminals have begun to directly target the data of these individuals and the platforms they frequent. A whopping $200 million is lost every year due to online dating scams, not to mention the damage that can be done when large sites experience data breaches. One such attack occurred in 2015 when the private information of 37 million clients was leaked by hackers targeting Ashley Madison. 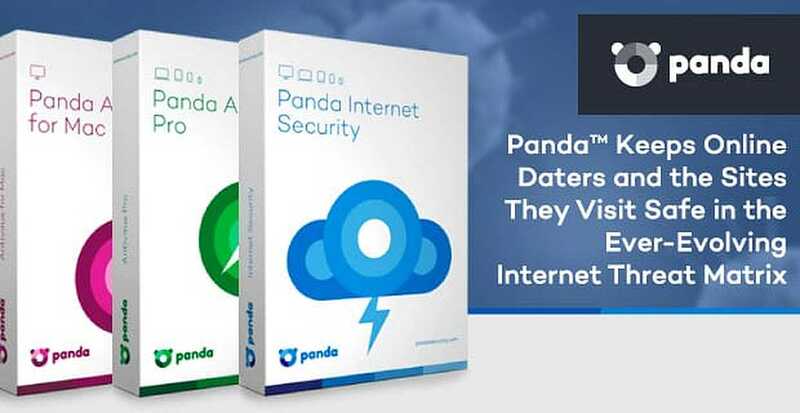 Fortunately, Panda Security provides solutions to safeguard both those looking for love on the web and the sites that house their data. Whether you’re a site owner looking for security or are just browsig the web, Panda protects your data. For two decades, Panda has been helping individuals browse the internet with the peace of mind that their information is safe. The company’s all-in-one consumer security suite offers top-of-the-line antivirus and antimalware software for use on home computers and mobile devices. Panda also acts as a watchdog for organizations and websites housing extensive amounts of proprietary and client data. Through a flexible, centralized interface, businesses can manage and secure all endpoints on their networks, ensure perimeters are walled, and identify and mitigate threats before they impact operations and clients. When dating on the web, you put your heart on the line, but that’s not the only thing at risk. The second you open your browser, your data and identity are also exposed to hazards. The stats show that swiping right has daters losing millions of dollars to web criminals every year. Although instances of these sophisticated schemes are rising at alarming rates, Panda has tools to save you the headaches associated with identity theft and malware. The company is an expert at identifying and mitigating the web’s emerging threats and offers a complete antivirus suite to keep you safe. With four levels of protection, Panda’s tool set brings solutions for any type of web user — from those who are online intermittently to frequent web browsers who need more power and additional storage. These security plans help you surf the web with the confidence that you’re protected. With Panda’s antivirus suite, users can download any type of file without repercussion, optimize the speed of their devices, and even keep inappropriate content away from the eyes of younger audiences. Online daters aren’t the only ones who need protection in this information age. Businesses who own and manage dating apps and websites are also experiencing increased instances of cyber attacks. The huge data breach at Ashley Madison was just one example of what can happen when networks and endpoints aren’t secure. Thankfully, Panda has an answer for businesses to safeguard data with a centralized IT management console. Adaptive Defense 360 combines advanced security technologies with detection and remediation features. The company’s endpoint protection safeguards all the devices attached to your network — be they laptops, smartphones, or PCs. Effective management functionalities allow you to orchestrate, monitor, and support all the systems your business runs — both in the office and remotely. Panda’s Fusion feature works to control and protect your IT infrastructure, and Gatedefender builds a perimeter around your corporate network to prevent intrusion and external attacks. To shield your hard-won clients from online fraud, Panda’s endpoint protection solutions keep all devices on a safe network so criminals can’t access their data. This keeps all computers in your network free from viruses and the prying eyes of those with malicious intent. The cloud-based interface makes management a breeze. Admins can remotely access the console from anywhere with an internet connection at any time of day. Since criminals don’t usually work the typical nine-to-five, the flexible, automated protection solves problems as they happen. This way, multiple platforms are protected through real-time monitoring so dangers are detected before they can cause damage. Panda provides a 100% cloud-based management platform that allows you to access user devices remotely and proactively solve problems. Minimal maintenance requirements also give you the freedom to streamline your IT team efficiently while security protocols are discretely running in the background. The company’s ticketing system is an excellent way to organize, classify, and prioritize incidents, and also provides a beneficial resource to learn how to guard against future incidents. Fusion empowers companies to automate the management and monitoring of all devices and infrastructure from a centralized interface. Since everything happens in the cloud, you don’t need to shoulder any additional infrastructure costs. Fusion can protect you on any platform, including Linux, Mac OS X, and Android, as well as file and Exchange servers. The best part is your users will never be disturbed. Everything runs silently on their systems without interrupting performance. Most of us have seen the detective shows where a perimeter needs to be set up around a crime scene. Gatedefender works in a similar manner to shield your company. It stops intrusion attempts and outside attacks, making it your first line of defense against those who would harm you and your proprietary data. The tool filters everything from surfing habits to email and online traffic. Gatedefender is also available in several different formats depending on your business’s needs. Panda offers versions in hardware, software, and virtual environments, so it adapts to your infrastructure, not the other way around. Its easy-to-use online console allows you to manage Gatedefender and access reporting and other dashboard information from a central location. Just as looking for love online is serious business, guarding your information on the web shouldn’t be taken lightly. A leader in the online security space for more than 20 years, Panda has shown its dedication to safeguarding companies and their data with experience and innovation. The company has served upward of 30 million users in over 180 countries with a simple mission: to provide dynamic, advanced security based on the principles of artificial intelligence. While online dating can be scary for a number of reasons, identity theft and data loss don’t have to be among them. Panda continues to grow and explore more ways to protect as many people and companies as it can in the ever-evolving online threat landscape.